Sweet gale was probably used already during the bronze and iron ages in Denmark to spice fermented drinks. A bucket made of birch-bark has been found with the dried residue of a drink consisting of cranberries, some wheat, glandular hairs of sweet gale and seed flour of the lime tree. The quantity of pollen grains (from honey) suggest that the drink was something between mead, a berry wine and beer. Additional finds of similar vessels suggest that the drink was common during the older iron age (approx. 200 A.D.). It was no doubt drunk on special occasions. Hops were probably grown in France and Central Europe in the 8th century in small amounts. A deed of gift from 768 A.D. has been found that mentions a hops farm but Holy Hildegard was the first, around 1160, to write about hops being used for flavouring beer. During the 1230s only sweet gale is mentioned at the Danish court. Hops had probably still not gained popularity in the Nordic countries at that time. In Sweden hops are first named in the provincial laws of Uppland and Gotland at the end of the 13th century. Then in the 14th century they are mentioned in the Södermanna, Västamanna and Hälsinge Laws as well as in Magnus Eriksson’s National Law. Hops were probably being used in Sweden around 1250. Hops were cultivated early on in monasteries. There are stories that claim that monks introduced the calming hops as beer flavouring instead of the stimulants sweet gale and wild rosemary. Beer brewing in Belgium is still closely associated to monasteries. Hops were intended to calm down the quarrelsome Nordic men and promote a quiet and virtuous lifestyle. 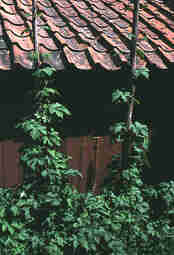 Hops were scarce in Sweden and so in Kristoffer’s national law of 1442, farmers were required to grow 40 poles of hops. During King Gustav Vasa’s time people drank at least a pitcher (2.6 litres) of beer a day because of the salty food – both men and women. Even before the end of the 16th century the commoners drank sweet gale beer and other substitute beers while the king’s men drank beer made of hops. An edict was promulgated in 1583 at Nyköping Castle that beer was to be made of malt and hops. The farmers cultivated hops which the crown then impounded leaving the farmers to drink small beer, sweet gale beer and a juniper brew. In 1568 King Johan III gave the order to enclose a large herb garden in Stockholm. It was expanded in 1619 to become a royal hops garden and it can be found on the city maps from the beginning of the 17th century. The name is even mentioned (Humblegårdeen, humbelgårdeen) in 1621 when a hired hand Lasse Mattzsson slew the “Hops’ Master” Daniell. Queen Kristina replaced it in 1648 with a pleasure garden. But the name “Humlegården” (Hops Garden) lives on although the area was only used for growing hops for 29 years, more than 350 years ago. Linnaeus wrote in his 1749 diary about beer and he returned to the subject in a publication by the Royal Swedish Academy of Sciences in 1763. He says that hops preserve the beer from souring by its bitter taste, that they have in themselves no intoxicating effect and that they help against kidney stones. Linnaeus thought that water from a well was the best drink but that did not prevent him from claiming that all households should know certain elementary things such as how to bake bread and brew beer.